杨龙翔, 薛秀秀, 闫伟, 等. 信阳台伸缩仪降雨干扰特征分析[J]. 大地测量与地球动力学, 2019, 39(1): 103-106. YANG Longxiang, XUE Xiuxiu, YAN Wei, et al. 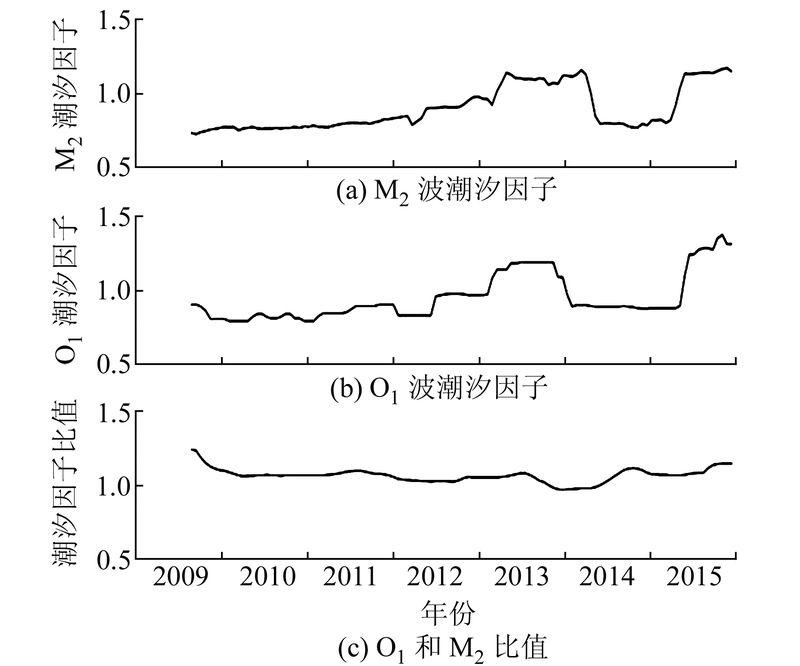 Analysis of Rainfall Interference Characteristics of Xinyang Station Extensometer[J]. Journal of Geodesy and Geodynamics, 2019, 39(1): 103-106. The Earthquake Tracking Task of CEA, No. 2016010221;The Spark Program of Earthquake Technology of CEA, No.XH16026. 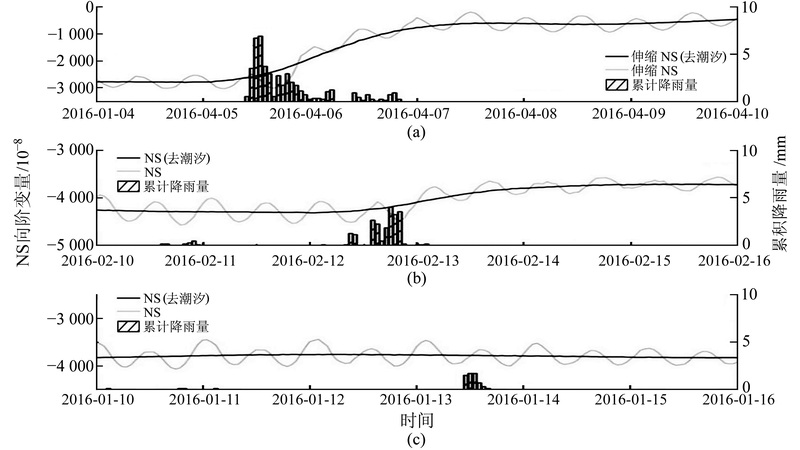 YANG Longxiang, engineer, majors in earthquake monitoring and prediction, E-mail: 13523407902@163.com. Foundation support: The Earthquake Tracking Task of CEA, No. 2016010221;The Spark Program of Earthquake Technology of CEA, No.XH16026. About the first author: YANG Longxiang, engineer, majors in earthquake monitoring and prediction, E-mail: 13523407902@163.com. Abstract: We analyze the regression relation between the extensometer observation data from 2013 to 2016 and the cumulative precipitation. 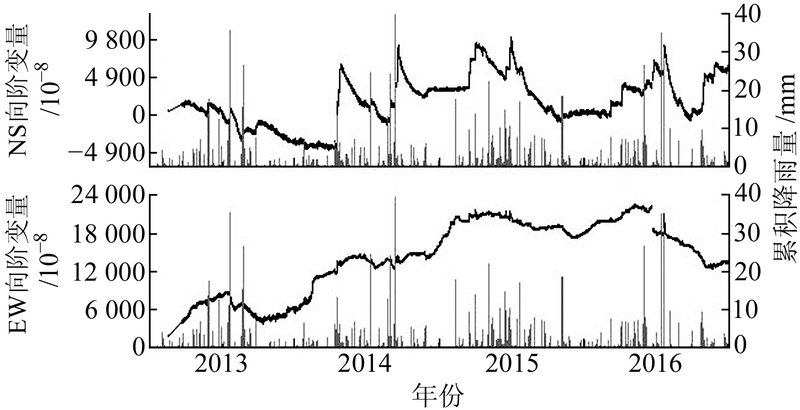 By calculating the M2 tide factor, we modify the extensometer observation during the rainfall, which plays an important role in eliminating rainfall disturbance anomalies.